From the top floor of a Plano office building, Randy Pitchford, Gearbox Software President and founder, sits in front of his computer viewing Google Maps, pointing to the area in Frisco Square where construction on the company’s five-story office building will soon be underway. Surrounded by his extensive collection of video game systems and Gearbox Software merchandise, he pans to the northwest on the map and points to land plots in Newman Village where he and several of his associates are building homes. Gearbox Software, a video game development company, expects to relocate its headquarters to the new 166,051-square-foot building in 2015. The idea of Gearbox Software in Frisco is not a new one. A deal to bring Gearbox to Frisco Square was originally announced in 2011, but it fell through because of issues with Frisco Square investors. Pitchford said a legal process throughout the last few years has cleared the way for the project to begin. Gary Paparella, owner of POParella’s Gourmet Popcorn and Treats in Frisco Square on Coleman Boulevard, said he and other area business owners were excited when plans for the Gearbox building were originally announced three years ago, and disappointed when the deal fell through. “It’s the biggest and best thing that happened to Frisco Square since the municipal building and Cinemark [Theater],” he said. Paparella said what is missing the most in the Frisco Square area is foot traffic. He sees a larger problem with lack of connectivity to the Frisco Junction, downtown Main Street and Toyota Stadium areas. The Gearbox Software building does not fix that, but will mean bridging the gap between the theater, municipal building, the hospital and the other businesses on Coleman Boulevard, he said. Cinemark especially has not had near the impact on Frisco Square businesses as it could have otherwise had because of the lack of a way to get from one side of the square to the other without crossing a field, Paparella said. 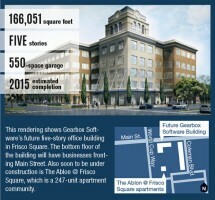 The walkability factor, with living, dining and entertainment options in a single area, is one of the main reasons Gearbox Software chose Frisco for its new headquarters, Pitchford said. Pitchford also has a vision for the bottom floor of commercial space in the building. “We’re not merely influencing the businesses that will move in there, but in a few cases we are investing and helping to create those businesses, one of which will be a restaurant and bar that is going to be themed around video games,” he said. Pitchford said he is also angling to see a new type of video game store, catering to fans of everything from new and old gaming systems to comic books and more. “If we get enough of these pieces together, we might have ‘Nerdvana,’” Pitchford joked. Cathy Sweeney of Wolverine Interests LLC, who purchased the land for Gearbox and is developing the building in partnership with Encore Enterprises Inc., said construction on the Class A office building will begin within the next 60 days. The building is being constructed with Gearbox Software’s specific needs in mind. “[The] most uniqueness is in the Gearbox Software floor designs, but we are assisting them with specifics related to balconies, security and unique signage that help promote their brand,” Sweeney said. Gearbox Software plans to initially take up about 60,000 square feet of the building—the top two floors—and will find tenants for the rest of the space. The bottom floor of the building will be commercial space that fronts Main Street, and a five-story, 550-space parking garage for office and retail use will be constructed south of the building. Gearbox Software started with 16 people in six offices in 1999 and has since grown to more than 200 employees who now take up the top four floors of a Plano office building, Pitchford said. The Gearbox team makes do with the space it has, but he said it is not ideal in an atmosphere that requires extreme collaboration. Pitchford said the company decided it was time to design a workspace that fit its needs in a building that is tops in technological advances in comfort and efficiency. While Gearbox Software could function anywhere as long as it had an Internet connection, Pitchford said most of the company’s employees are settled in North Texas, which was a deciding factor to stay in the area. He said they talked to a number of different area cities before making a decision. “When we founded the company in January of 1999, I was 15 years younger, my partners were 15 years younger and the people that founded this company were 15 years younger,” he said. “In that 15 years, we’ve grown families, and we’ve become a much larger community of people. So some of the priorities change for a number of us as we get older. Yet we are a growing business, and the people that join the studio are creative or engineering types of all ages,” he added. He said they were looking for the community that would afford the best lifestyle for the wide range of employees and that would grow along with Gearbox Software. Gearbox Software Community Manager Chris Faylor said the company has a Community Day program, where they rent out a large venue and invite the public to play existing and upcoming Gearbox Software games. Attendees can learn about video game development and how to get involved in the community. Pitchford is also pushing for a possible eventual tie-in with the Videogame History Museum, which is competing along with Frisco Arts to lease the back-of-house space in the Frisco Discovery Center, just a short distance from Frisco Square. The Frisco Community Development Corp. is expected to make a decision on the space in the near future. Pitchford said the science and creativity that have gone into the video game industry can be an inspiration to youth. “How great is it to have things that inspire us to care more about our minds—critical thinking, creativity—and start to focus in on the kinds of things that whether or not you become a game maker, have a mind that is finely tuned to making the world a better place,” he said.